Modern dimensioning systems can readily determine the size of the individual items that are to be shipped. 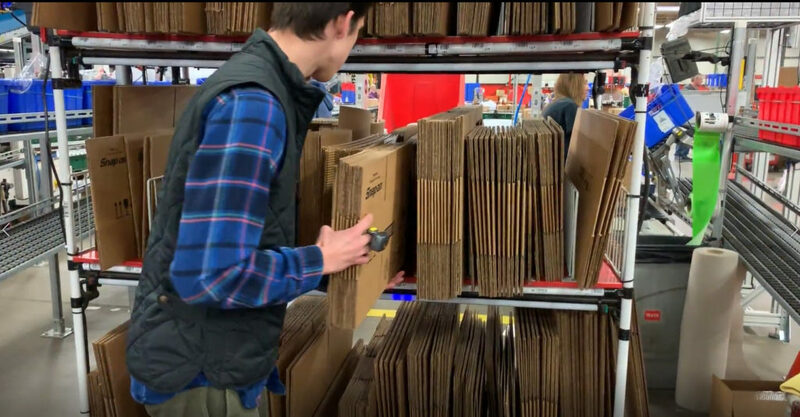 Given the dimensions of the items to be shipped, FastFetch’s solution uses clever AI techniques—much like game-playing algorithms that can determine a good move in checkers or chess—to explore possible item placements and orientations and arrive at an optimal-sized shipping carton. FastFetch’s algorithm for determining the optimal shipping carton executes in less than a second for most practical applications. FastFetch’s solution is a complete solution encompassing carton storage, carton selection, and replenishment of consumed cartons. 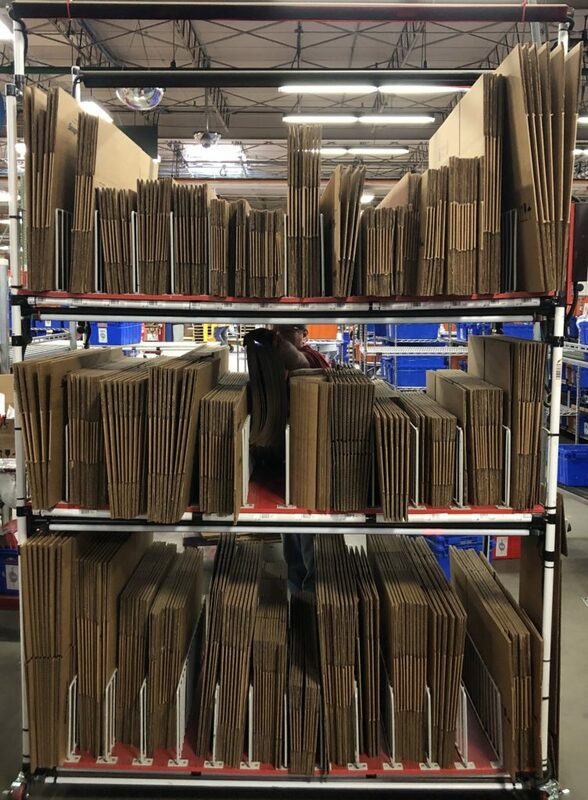 FastFetch analyzes historical order records to identify an assortment of cartons—perhaps 40 or more—that will accommodate the entire set of past orders with minimal wasted space. Multiple units of each of the assorted carton sizes are then maintained in carton racks positioned at packing stations. The system uses item dimensions to quickly determine which of the assortment of cartons is optimal for packing a collection of items with minimal wasted space. The system then identifies the optimal carton by illuminating a strip of light-emitting diodes (LEDs) so the packer can quickly access the optimal carton as soon as it is needed. Consumed cartons are replenished on the carton rack using voice and light-directed technologies on a delivery cart. Finally, orders are sent to a carton supplier on a frequent basis to replenish cartons that have been consumed. Learn more about Shipping Cost Optimization solutions! FastFetch is an innovation leader in the distribution and logistics industries with our technologies supporting numerous distribution and manufacturing companies across a wide spectrum of product lines. © 2017 FastFetch Corporation. All rights reserved. FastFetch was launched in 2006 with the objective of improving the speed and accuracy of piece picking by combining light-directed picking and putting technologies, wireless barcode scanning, and voice into a single system that enabled a human operator to fulfill multiple orders with a single trip through the picking area. There were two primary motivations behind the ideas that led to the creation of FastFetch. The first was the recognition of the huge upswing in e-commerce activity that was beginning to take place and the second was the lack of affordable technologies to support order fulfillment tasks that are best performed by human operators. We assembled a team of hardware and software engineers who set out to create a revolutionary system for order fulfillment. The early days were spent creating and testing the hardware and software designs, working with suppliers to create a supply chain, securing patent protection, and gaining field experience with our early adopters.